Coping with the impending loss or loss of a pet is one of the most difficult experiences a pet parent will face. Whether your furry friend is approaching his golden years or has been diagnosed with a terminal illness, it’s important to calmly guide the end-of-life experience and minimize any discomfort or distress. As your pet’s health declines, you may elect to care for your pet at home-with the supervision of a veterinarian-or you may decide to end his suffering with euthanasia. I have found this to be even more so the case with our pet pigs. We spend our days building our schedule around accommodating them, we don't take vacations because we do not trust anyone to care for our pet pigs the way we do, we spend hours researching the right bed that will support heir weight, we spend many many hours researching diseases and educating ourselves so we can be more prepared for any situation that may come our way. So, losing one of these balls of joy is so heart wrenching that we feel like one of our children has passed away. Whatever course you choose, you’re not alone, many people have been put in your shoes and been forced to make a decision on the spot. We’ve created this page to help you with making an informed decision regarding your pig. This is a decision only you, your family and your vet can decide. Pig parents are HUGE advocates in preventative medicine and helping each other in difficult situations where all hope seems to be lost. Pig families have rallied together on many occasions to raise funds for a sick or injured pig, Mo Money for pigs is a 501(c)3 charity that assists with emergency funding for pigs who have suffered accidents or illnesses and the family isn’t able to pay the vet bills. If the only reason you are contemplating euthanizing your pig is financial, please click here to view the resources available to you that may be able to help with vet bills. (see section marked financial assistance) If there is chance of recovery or good quality of life, obviously it's still your decision on how to manage your pig's needs, but many pigs recover from major traumas every day and have great lives for many more years…please take that in consideration when making your decision. Some pigs do well for a while because the care for their specific needs are personalized to their particular situations, often time, pain control, specialized nutrition, immuno-nutrition, and love are a part of keeping them healthy longer. Again, these types of conversations need to take place between you and your vet to decide the best possible decision. They didn't spend all that time in school or become veterinarians because they didn't like animals, they came vets because of their love for animals, keep that in mind as you listen to suggestions. 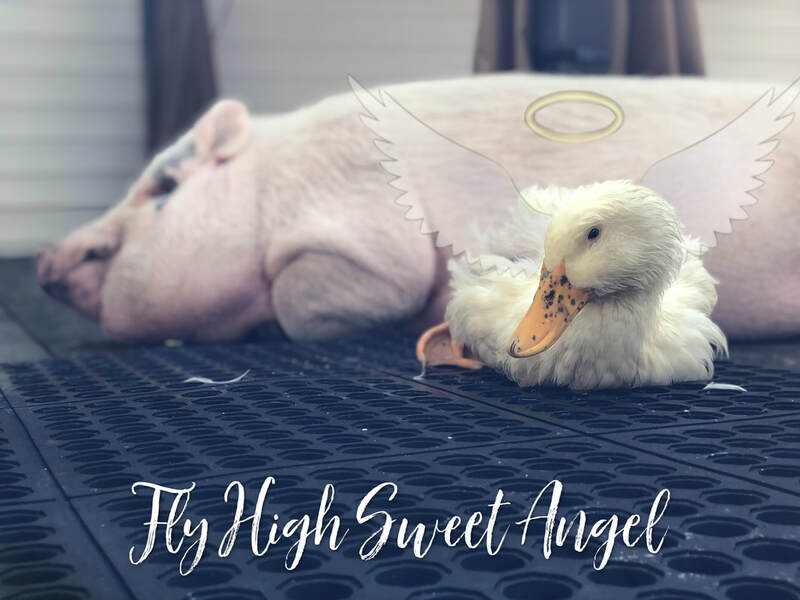 I have seen posts on Facebook where the pig parents wake up and their pig is gone, had crossed over rainbow bridge while they were sleeping or passed away unexpectedly. These situations are extremely difficult to handle. The loss of your pig friend, the family's reaction to the loss and the unexplained death weigh heavy on the heart. If you have more than one pig, and your pig has become used to a second (or third, fourth, etc) pig around, your pig will likely grieve the loss of a pig friend as well. Your pig may actually cry real tears or lay in a particular spot that they shared, refuse to eat or drink, and sometimes fail to thrive. Provide your pig with additional support, make sure your piggy knows he/she is loved and maybe spend some additional time with him/her. They must process these feelings too though, so please understand this may take some time. If one of your pigs has passed and your other pigs are there too, they may gather around the deceased pig to say their goodbye's. That's ok.
Much like other pig siblings, many of our pigs become friends with our other pets. Pigs are highly intelligent as you likely already know. They can sense when something is wrong, when you're sad or angry and more importantly, they experience love and compassion as humans do. If you have another pet that passes away that your pig has spent time with, your pig may experience grief with you. Again, this is natural and ok. 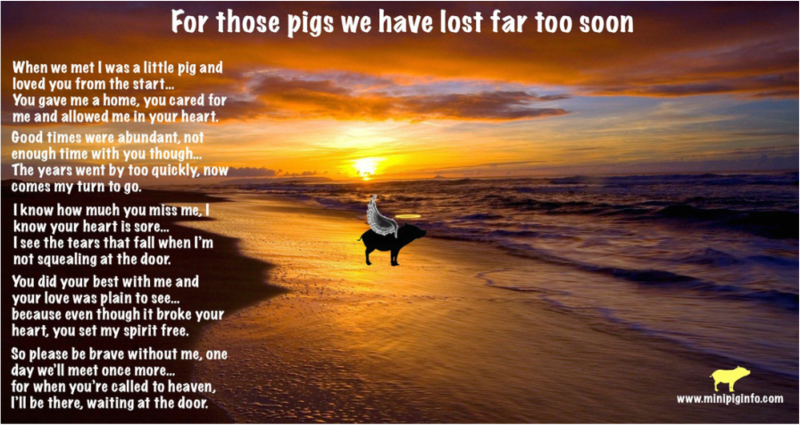 Allow your pig time to grieve. Make your pet feel secure by surrounding her with her favorite things, like a warm blanket or special squeaky toy. Since pressure sores can develop in pets with limited mobility, it’s also essential to provide a warm sleeping spot with plenty of cushioning. Pressure ulcers can occur if your pig is laying on one area for long periods of time, if your elderly pig isn’t very mobile, use pillows to prop your pig on one side or another and change this position to the other side every few hours to prevent pressure from being on one part of the body for too long. Some older pets may develop incontinence, or the loss of bladder control, so be sure to check your pig friend regularly for any wetness or soiling. If your pet needs help getting up to urinate or defecate, you can purchase a sling or use a large towel to wrap under her body and assist her. This isn’t always an easy chore for pig owners as most grow to sizes that we aren’t able to pick up at maturity. What Determines a Good Quality of Life for My Pet? Does your pet seem irritable, restless or confused? Has he lost his appetite or does he drink water excessively? Does he avoid his favorite activities or not as mobile as he used to be? Do other animals in the home pick on your pet? This can happen when a sick or elderly pig becomes the weakest member of the “pack” or in a pig family “herd”. Does he seek out unusual places to sleep or hide? When your pet’s quality of life deteriorates due to an untreatable disease or aging, please speak with your veterinarian and family members about end-of-life issues. How Can I Tell if My Pig Is in Pain? If you’re unsure of how much your pet is suffering, keep a daily record of good days and bad days. It’s also important to ask your veterinarian for the exact signs of suffering likely to be associated with your pet’s condition or disease. Are There Any Behavioral Changes I Might See in My Sick Pet or Other Pets in the Household? Irregular behavior patterns are often the first sign that your pet is ill or in pain. A pet may lose his normal activity levels, appetite and grooming tendencies, or he may exhibit inappropriate elimination, vocalization and aggression. With pigs, they tend to mask signs of pain or discomfort as long as possible because they’re prey animals and showing weakness could be life or death for them. Other healthy pets in the household may experience similar abnormal behaviors as a reaction to the changes and distress of your sick animal companion. Be sure to get regular check-ups for all of your pets to monitor and protect against any undiagnosed issues. Other pets may sense something is wrong with your pig and be more sympathetic or they may have an opposite reaction and pick on the sick or hurting pig. What Are Some At-Home Pain Management Options for My Elderly Pet? If you suspect your pet is in pain, please make an appointment with a veterinarian for a physical examination and consultation. Your veterinarian will explain the pain management protocol associated with your pet’s specific condition. For pain due to arthritis, for example, a non-steroidal anti-inflammatory drug may be prescribed, but only after blood tests ensure that your pet does not have kidney or liver problems that would preclude using this type of medication. If your pet has more severe pain, due to a chronic illness like cancer, your veterinarian may prescribe a narcotic pain killer in the form of an oral medicine or a patch that is placed on the skin. Because we already know some disorders are common in pigs, you can start to treat prophylactically early on…be sure to ask your vet if they feel that would be beneficial for your pig. What Is Pet Hospice Care and What Are Its Benefits? What Are the Goals of Pet Hospice Care? Hospice care-also called palliative care-is an option for pet parents who want to engage in an extended good-bye or are opposed to euthanasia. Pet hospice is an option if your pet is suffering from a terminal illness and a cure is not possible. The focus is to make a pet’s final days or weeks more pleasant with the proper use of pain medications, dietary strategies and human interaction. Pet hospice is not a place, but a personal choice and philosophy based on the principle that death is a part of life and can be dignified. The goal of pet hospice is not to cure your pet’s illness but rather to ensure a peaceful end-of-life experience. Palliative care or hospice allows for a pet to stay at home with visits regularly from the hospice provider to be sure the situation doesn’t warrant any additional treatments and also train the pet owners to recognize the signs of end of life and how to treat these symptoms. The goal is for your pet to be as pain free as possible and allowing you the opportunity to participate in grieving exercises so you’re better prepared when that day arrives. Although hospice care is a growing area of veterinary medicine, we need to be very careful not to prolong the suffering of pets who are in pain or experiencing poor quality of life. It is very difficult to face losing a pet, but our choices must not be clouded by fear of the grief we will experience. Some vets feel palliative care and hospice only prolongs the inevitable. A participating veterinarian (or pet hospice service) will teach pet parents how to provide intensive home care to keep an ill pet as comfortable as possible. Every pet parent should also have a back-up plan, which may include euthanasia, in case the animal's suffering gets out of control. Should I get a second opinion on a terminal diagnosis? That is solely based on your comfort level with your vet. If you feel comfortable with your veterinarian’s diagnosis and treatment plan, you do not need a second opinion. If you feel like your pig can be saved, YES!! Get a second opinion and work through the difficulties. Just remember, there are some diagnosis’s that are terminal. There are some disorders that can’t be explained, therefore, they also can’t be treated. Pigs aren’t the most well known pets in a household, therefore the data and research is limited unfortunately. Will My Pig Show Signs that He Is Ready to Pass Away? Be able to recognize signs of physical suffering typical of your pet’s age and/or illness. Your veterinarian is the best source of this information. Prevent unnecessary suffering in your terminally ill, injured or aged animal by finding ways to assess your pet’s quality of life. With your vet’s help, figure out the signs of a good day compared to a bad day and keep a record of how often the signs of pain appear. Be as informed as you can about your pet’s behavior. Being unaware or unable to assess signs and symptoms will exhaust family members and put your pet at risk of lingering longer than is comfortable. Keep a journal is you need to so you are better tuned in to the needs of your pig. Know the time frame when discussing end of life for your terminally ill pig. Your vet will likely give you a time line on when things will progress towards end of life. Some pigs have a more difficult time crossing over rainbow bridge and this can really weigh in heavy on the heart. If your vet thinks the suffering and pain will be substantial, they may recommend you euthanize versus letting nature take its course. 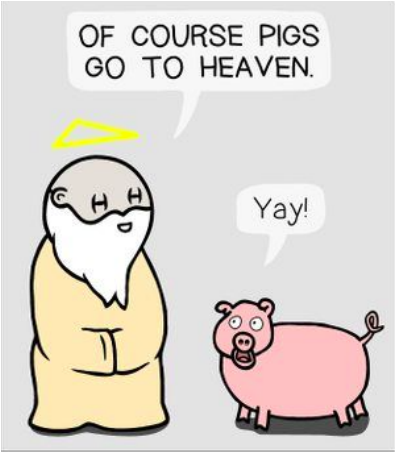 And in some cases, this is the most humane way of letting your pig go to piggy heaven. Euthanasia provides a painless, peaceful end for a pet that would otherwise continue to suffer. Your veterinarian has special training to provide your pet with a humane and gentle death. During the procedure, your vet will inject your pet with a sedative followed by a special medication. The animal experiences no awareness of the end of life-the process is similar to undergoing general anesthesia for a surgical procedure and takes about 10 to 20 seconds. This isn’t always easy to accomplish in pigs. In MY experience, it was horrible and took multiple doses before my pig was actually euthanized. How Do I Know When Is the Right Time to Euthanize My Pet? Your veterinarian is really the best person to advise you on when the time is right to euthanize-information from medical tests is often more accurate than what a pet owner can observe, and pet owners often delay the moment of euthanasia in anticipation of grief. Observing and keeping an accurate record of your pet in his daily activities can help you to decide. If you observe that moments of discomfort outweigh his capacity to enjoy life, it is time to euthanize, even if your pet still experiences pleasure in eating or socializing. If your pet is in pain, your main goal should be to minimize his suffering. There are a lot of times when we, as pig owners/mama daddies, let our selfish wants get in the way of suffering and we chose to prolong a life that truly isn’t of a great quality. If your vet decides that your pig will suffer much longer with aggressive treatment, but there is no or little likelihood of any kind of recovery, the decision should be made as to whether or not you chose for your pig to live in pain or to put a stop to the suffering. Losing an animal is never easy, having to make that decision yourself? Even worse…. Will my Other Pets Grieve a Pet Who Has Passed Away? After the loss of a companion animal, many people observe a change in their surviving pet’s behavior. Sometimes the pet appears depressed and shows diminished interest in play or food, and it often helps to simply give your surviving pet some extra attention and love. If your animal companion appears upset, check with a veterinarian to make sure there is no underlying medical problem causing his behavior. This is even more so with pigs, pigs have herds that are family to them. If you have more than one pig and your pig is bonded to another? The pig left behind will likely grieve. You may notice your pig left behind will go to “their spot” and sit and wait, maybe the pig left behind doesn’t want to eat or drink for a day, you may even see real tears come out of the eyes. It is also well documented that pets can recognize death in a companion animal. Domesticated pets, including horses and pigs who see the deceased body of an animal they knew can adjust very well and spend less time searching and grieving than pets who have not seen their companion’s remains. Is there some kind of support group or system in place for those who have lost pet pigs? 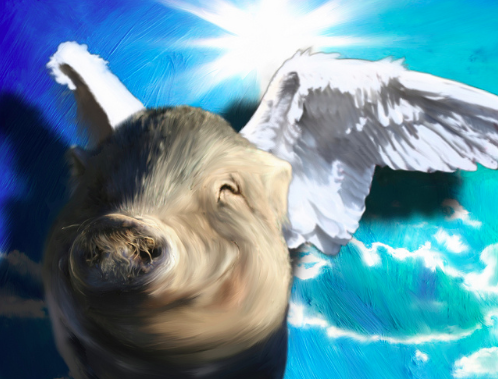 There is, one of those groups is on Facebook called angel pigs. If you are a member of any pig group, typically your pig friends will grieve right along side of you as you say your goodbyes to your beloved pig. There are also support groups online like the ASPCA, petloss.com (http://pet-loss.supportgroups.com), petloss.net, and if you do an internet search of pet loss support, you will see many other organizations that can assist you in grieving the loss of your pet as well as help you develop or establish new relationships with another pet. My pig passed away unexpectedly, what can I do to safeguard my other animals? An unexpected or untimely death leave the mind and heart in chaos. If you are unsure why your pig passed on, get a necropsy. Find out why, get some answers to your questions. Peace of mind is priceless at times, especially if you're unsure why it happened and you have another or other pigs and want to be sure the cause isn't something that can be passed on to other animals. Some times there are situations that don't have a clear, concise answer. Other times it does and measures need to be taken so your other pig or other pets aren't exposed to the same thing that claimed the life of your pig that passed on. Please let us know if you need anything, we are happy to point you in the direction of someone who can preform a necropsy or a lab that can test tissue samples. Pets observe every change in a household, and are bound to notice the absence of a companion. Pets often form strong attachments to one another, and the survivor of such a pair may seem to grieve for its companion. Pigs will grieve for other pigs as well as other species of animals. They know when you are hurting, they may grieve as well and act depressed. A new pet should be acquired because you are ready to move forward and build a new relationship-rather than looking backward and mourning your loss. When you are ready, select an animal with whom you can build another long, loving relationship-because this is what having a pet is all about! However, no one will judge you if you decide to get another pet soon after the loss of a beloved "family member"/pig. If your heart is ok with accepting a new pig in your life, then follow your heart and do whats right for you and your family. Dr. John Carr, editor of “Managing Pig Health: A Reference for the Farm” and a group of dedicated volunteers to sponsor a comprehensive medical database for pigs. The Swine Medical Database is the first of its kind, and was established in part in 2000 when Duchess, a potbellied pig, passed away from seizures at only 2 years old. It is 100% free to use, open to both the public and veterinarians. Visit the site for more info, and here's some answer to FAQ's below! Do I have to have an account to search the SMD? You do not need an account to search the database. However, if there is excessive searching then we may need to restrict this is some way. Why do I have to have an account to add details to the SMD? In this day and age where there are so many worthless spammers around we have to have some restrictions on who can add information to our database. If you know a spammer, do the world a favor and turn them over to law enforcement. Why should I add details to the SMD? The SMD was created to help swine breeders, owners, researchers and veterinarians to research and develop treatment plans for all pigs everywhere. The more information entered into the database the ore information is available for everyone and the faster pigs can be treated in to future. What happens when I submit a case? Once you have submitted a case it will go on a queue for our staff to review. After reviewing the case our medical staff will decided whether we have enough information to publish the case or not. If we don’t we will contact you and ask for that information, probably by getting you to update the case and resubmitting it. Once this process is completed will will release or reject the case. If I remember something to add to my case after I have submitted it, what do I do? You will be able to use the ‘Maintain Pigs’ menu option under the ‘Database’ menu to list all of the pigs you have added to the system. Next to each is the ‘case maintenance’ button, which will list the cases associated with that pig. You will be able to see the status of each case and if it is not currently being processed by a staff member, you will be able to make changes to it. What do the status ‘Confirmed’ and ‘Confirmed-A’ mean? Confirmed simply means that the case has been reviewed by our medical staff and has been found to be accurate and medically sound. Unconfirmed means that there may be some areas of the case that are less than medically sound, but the general details are deemed helpful for the public. If the ‘-A’ suffix is present then this indicates the record has been transferred from the Duchess Fund database. Usually in this case there is less information available as the old database was very restricted.